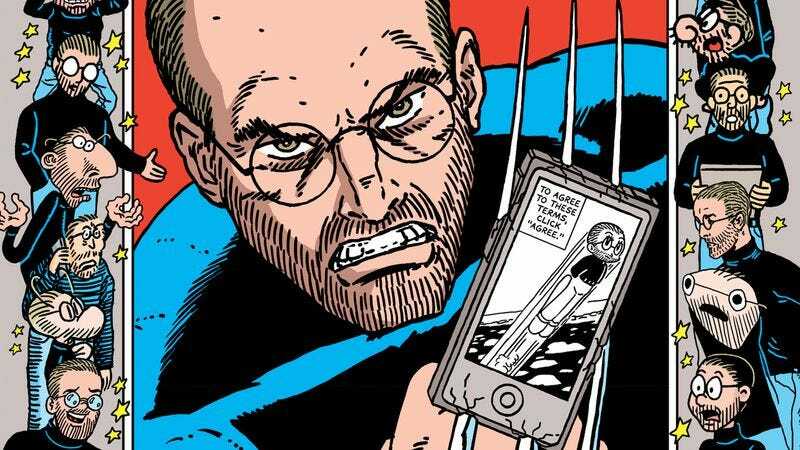 In September 2015, cartoonist R. Sikoryak embarked on a fascinating creative endeavor, launching a Tumblr account dedicated to the adaptation of Apple’s iTunes contract through single-page pastiches of the work of comic artists through history. It was a fascinating way of getting people to read a contract that many sign without actually knowing the specifics, and showcased the broad range of Sikoryak’s talent as he channeled the aesthetics and storytelling of an extremely diverse group of creators. His work is being collected in new week’s Terms And Conditions graphic novel from Drawn & Quarterly, featuring revised versions of his Tumblr comics, many of which are newly colored. The color adds another artistic element for Sikoryak to homage, and Sikoryak (along with coloring assistant Brian Weaver) does exceptional work replicating different coloring styles. This preview of Terms And Condition begins with Sikoryak’s take on Art Spiegelman’s Breakdowns cover from 1977, then jumps to Akira Toriyama’s Dragon Ball, Mariko and Jillian Tamaki’s This One Summer, Jeff Smith’s Bone, Lynn Johnston’s For Better Of For Worse, and ends with Fabian Nicieza and Rob Liefeld’s New Mutants. It’s an extremely effective exploration of the versatility of the comic-book medium and it’s capacity for personal expression, and the juxtaposition of the text and the artwork makes Terms And Conditions a surprisingly hilarious read. Each turn of the page is an exciting opportunity to see Sikoryak pay tribute to a different creator, and reader can discover the full scope of the graphic novel when it goes on sale on March 8.